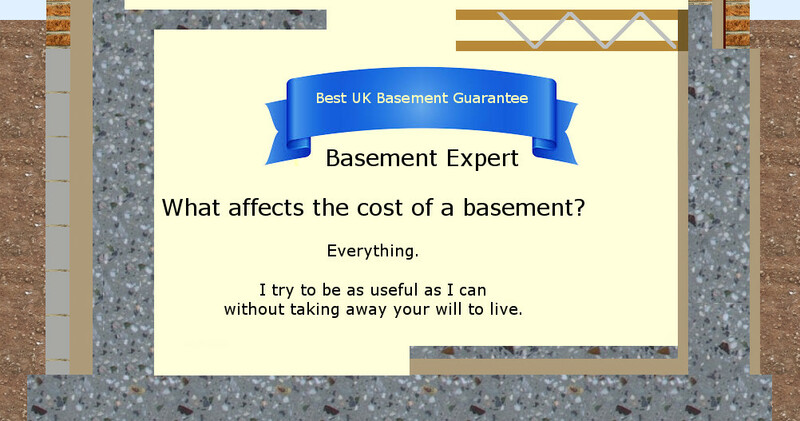 What affects the cost of a basement? Repairs. If you or your 'specialist builder' leave you the problems mentioned in this newspaper article, you have wasted a lot of money. Are you planning to go under a house already there, or tight behind a house to extend it? Entirely new dwelling, an empty dwelling or lived in? What size is the most cost effective? The graphics at the top of each page vary sometimes. 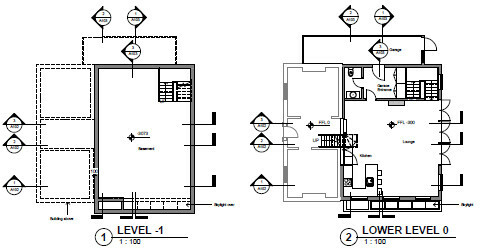 There is more than one way to design a basement structure. You should decide what you want: insulation, the type of floor over, underfloor heating and so on, then design the basement to suit you. How does shape affect price? Proximity of neighours, boundaries and highways. How do costs vary with different soil? Using products with BBA certificates unnecessarily. Can I have a basement in the water table, for instance, down at the same level as the Thames? 1 and 2. Under or tight against something already there. The problems in this Evening Standard article, costing an average of £24,000 to sort out, are all concerned with basements burrowed under houses already there or tight against the back of a house already there. and the variety of cost for the same basement in terrible conditions could be 100 times that in easy conditions. Where land values are the highest, the water table is the highest as well and the soil the very worst: running sand. Also, these places have the least room around them as well. So in Kensington and Battersea where it would be extremely dangerous they find it economic to build a basement for £1 million that would be uneconomic for £60,000 in Norfolk - where it would be much safer. Kensington. Not me. £millions. Kingston. 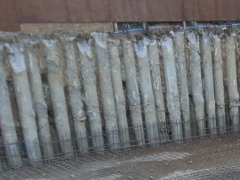 Piling to hold up the neighbours. Me 2013. Esher. Underpinning to hold up the house being extended.Me 2016. Bury St Edmunds. A hole. Me 2015. 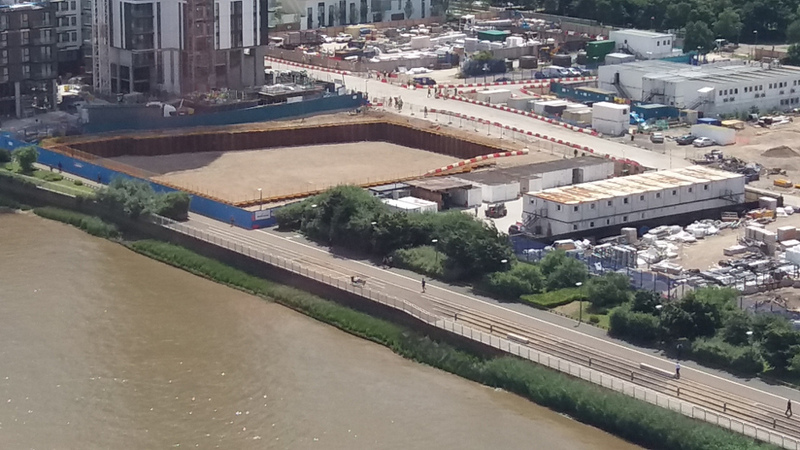 Please don't under-estimate the cost in money, human life and your neighbour losing their home if you dig deep under a house into tidal Thames water and running sand without being able to pile first. Unfortunately, being able to pile the entire perimeter first when you have a terraced house is likely to be impossible. I have not done it. I would not do it. I will not help you go under anything already there close to the Thames. 3. New, Empty or lived in? An entirely new dwelling can be zero rated for VAT, though you still pay VAT on anything not a part of the build, such as tool hire, design and management. An empty dwelling might be refurbished for only 5% VAT. A dwelling already lived in and being extended suffers the full 20% VAT. 4. What size is the most cost effective? 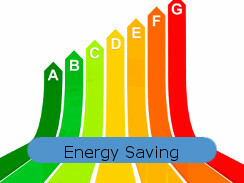 In many cases, the basement exactly the same size and shape as the house above it is the most cost effective. This is because the whole cost of foundations is saved. 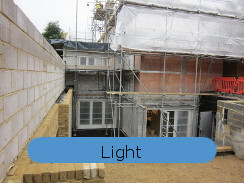 But the new dwelling might be built very close to the boundaries either side and within 3m of neighbouring structures. Building close to boundaries adds cost supporting those boundaries during excavation. 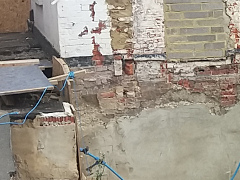 Excavating within 3m of and deeper than neighbours' foundations means you have to comply with the Party Wall Act, and that can be expensive. 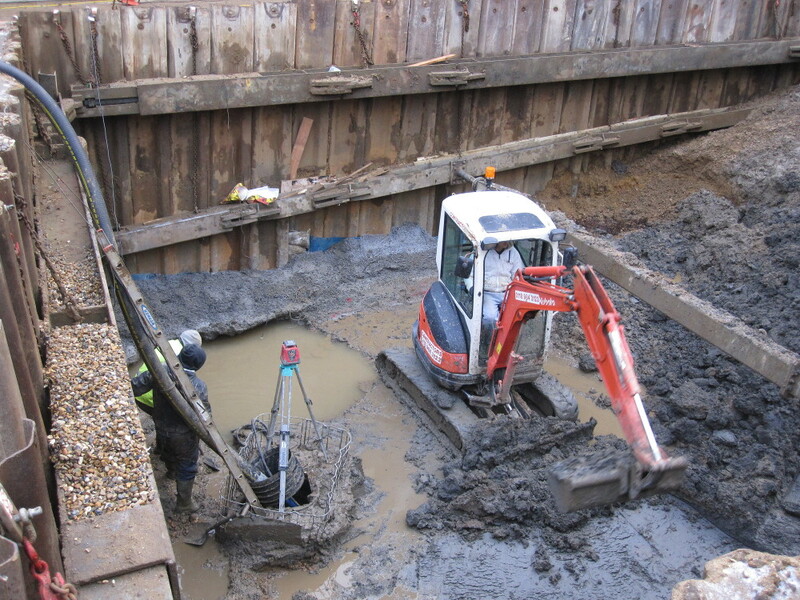 Complying with the Act often involves a number of expensive surveyors as well as piling the sides. 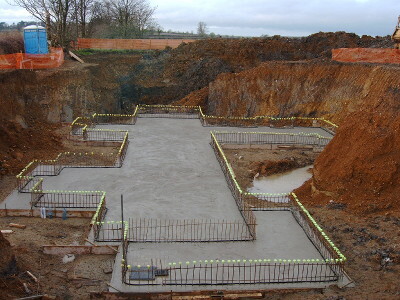 If your basement is smaller than the house above you will need house foundations as well. 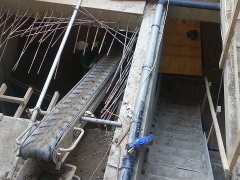 And these will either have to be deeper than usual or tied in with steel reinforcement. The bars are cast in the basement wall and they will be bent to be in the extra footing as well, connecting the two so they could not separate. If your basement is larger than the house above, you will need waterproof roof to your basement. Waterproof concrete would be far cheaper than membranes because waterproof concrete lasts far longer. 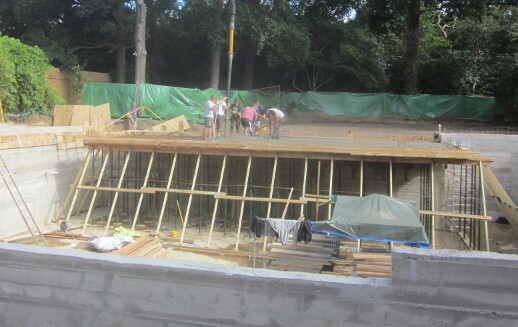 In this photo, you see the team pouring the podium deck using a concrete boom pump. This concrete will be beneath the patio when the house is finished. The other consideration is that a small basement has relatively more retaining wall and relatively more working room excavated than a larger basement. This is very much an average size basement. The house will be 3 times the size spreading equally either side. It was quite cheap, the client called in favours for all his labour. Nothing fancy, just waterproof. Clearly, there might be a trade off between size and cost. 5. How does shape affect price? You can see that the basement just above has the minimum 4 sides and the minimum 4 corners. This means very little timber was cut to get the dimensions right so lots of it was re-used, saving money later. The more corners the more formwork has to be cut to the right length, producing more offcuts. Each corner costs a little bit more and takes a little more time. This house had 28 corners and 4 T junctions. There were good reasons for all of them, in this case. If you excavate anywhere near a public highway you introduce another level of bureaucracy. Unfortunately highway authorities have their budgets cut so they have no expertise left in house, which makes them more difficult to deal with than they used to be. They will make you pay for private consultants to check all your calculations and so on. 7. How do costs vary with different soil? Is there any chance that your soil can be recycled? Will your soil be accepted by the landfill site, or does it contain rubbish or concrete that cost more to dispose of? Will your soil be too wet to transport and need stockpiling for a few months? If so, where? If your ground always drains: sand, gravel, chalk, perhaps you won't need any internal waterproofing. If your foundation level is weak you might need to dig out soft spots and replace them with stone or extra concrete. If you dig deep into clay will your basement be buoyant and need extra mass? Can you fill 8 wheel tipper lorries with your excavator as it digs? Or will you need grab lorries that take 2 tonnes less and cost more. Or will you need conveyors or dumpers to move soil before it can be loaded. Clay can dry, shrink and sides collapse dangerously during hot weather. Silt soaks up water and can be untransportable in winter. Trees dry ground out during spring and keep it dry through the summer. So you need to know your soil to plan the best time to dig it and have it carted away. 8. Using products with BBA certificates unnecessarily. Concrete never has a BBA certificate. Hardened concrete is tested to BS EN 12390. Part 3 is the test for compressive strength. Part 8 is the test for permeability of concrete by water under pressure. Yet your architect and your engineer are both likely to specify a concrete admixture they think waterproofs concrete but doesn't, because it has a BBA certificate. And because it has a BBA certificate the producers think they can charge a fortune for something proven not to work. The absolute truth is that the BBA certified admixtures are added to an already impermeable mix of concrete and do little or nothing. Many are mostly just a bit more cement for a lot of money. Most of the others provide no benefit. The producers send people to present to architects and engineers who seem, unfortunately, easily hoodwinked. I will help you buy waterproof concrete for less money and get your evidence, a test certificate to BS EN 12390 part 8, that the concrete you used in your project is impermeable. 9. Can I have a basement in the water table, for instance, down at the same level as the Thames? 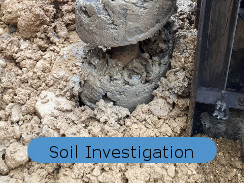 See a 19 second video showing what happens down at water level if you dig or auger , such as CFA piling, into or through the water bearing layer here. The short answer is Yes You Can If Your Pockets Are Deep Enough. 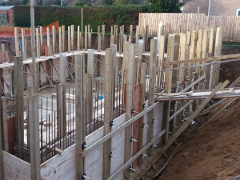 It will swallow money because arrangements have to be made, such as a perimeter diaphragm wall, steel sheet or secant piling or pile casings, to stop the ground collapsing in sideways as you extract gravel from water. 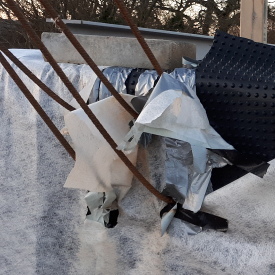 If you allow any material at all to come in from the sides then the ground around is going to have to settle and you might cause subsidence to neighbouring properties. You have to find a way to control and reduce the water coming in to your excavation if you are close to and lower than a nearby river. 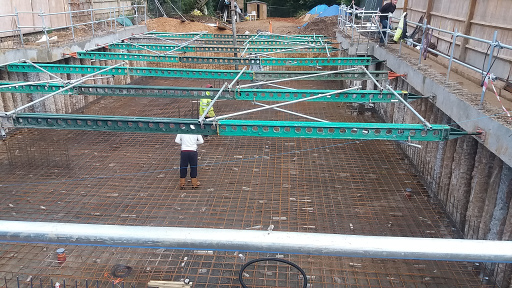 The basement really should be built so it is waterproof so that other waterproofing measures are not overwhelmed. Care must be taken with the maths to be sure that the basement could not float and rise, not least because it would settle unevenly. You would need to make sure there wasn't a way in for water if the nearby river flooded.